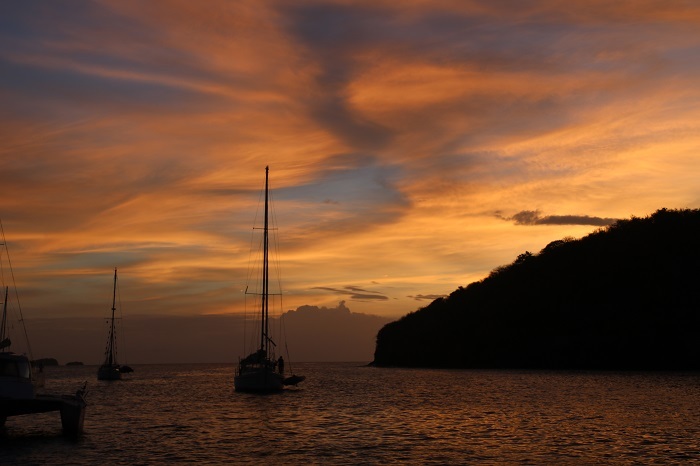 One of the best parts of cruising the Caribbean is the opportunity to see iconic yachts and lots of sailboats. 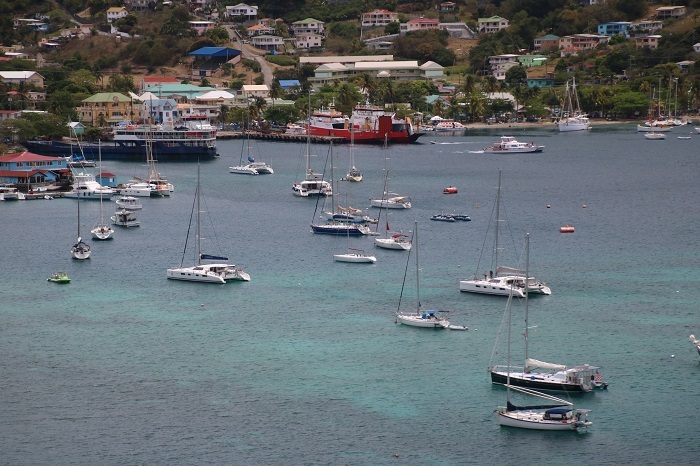 Unlike US waters where it seems that powerboats are dominant and sailing is ever so slowly fading from the scene, when you get to the Caribbean, especially the southern part, the vast majority of yachts are sailboats and sailing is where it’s at. In addition to the great variety of yachts, in some of the harbors that we visit we often see some of the smaller cruise ships drop anchor for the day. Most of them are not memorable but a few days ago Sea Cloud, the largest private yacht in the world when she was launched in 1931 for Marjorie Merriweather Post and her then husband E.F. Hutton of Wall Street fame, came in for the day. While she was a private yacht in Post’s day, she’s now a very exclusive cruise ship. 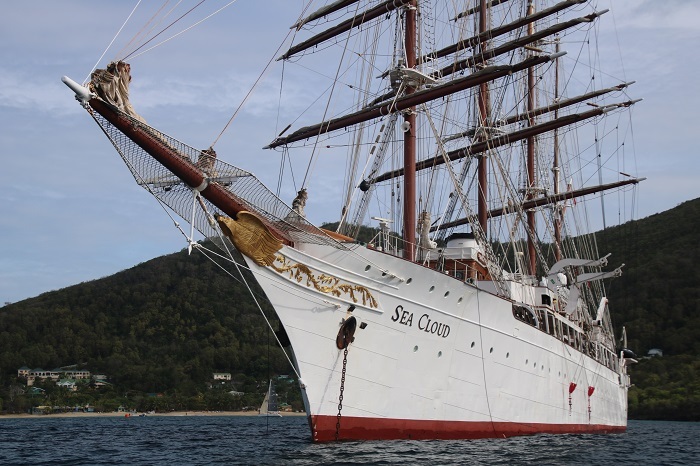 During WWII Sea Cloud was requisitioned by a US Navy, for $1 a year and put to work as a weather ship off of the east coast. 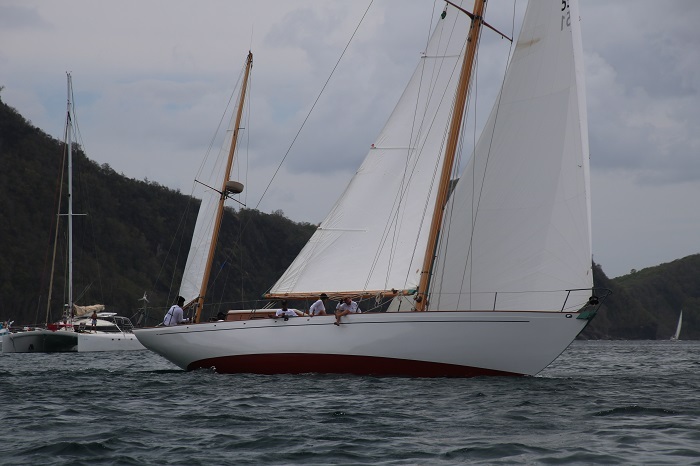 After the war she was returned to Post and converted back to a sailing yacht. 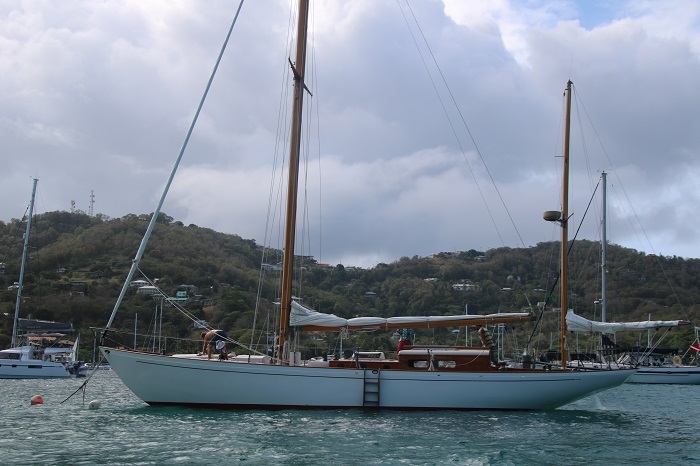 However, the cost of the yacht, with her 72 full time crew members proved to be a bit much for her to keep up so Post sold the yacht. 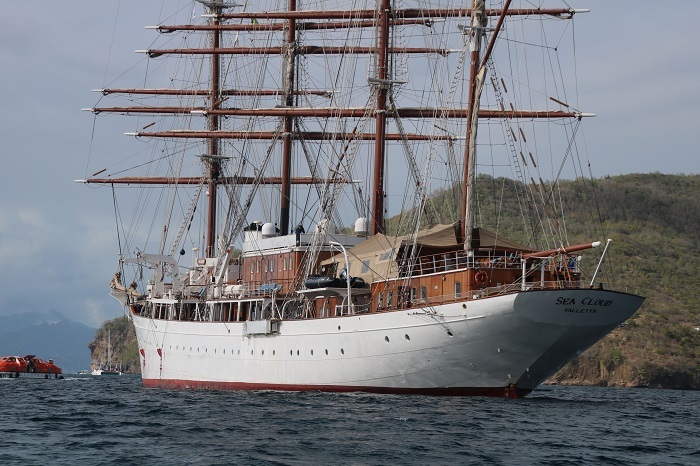 Sea Cloud has had a number of owners since then but beginning in the early 80s she has served as a cruise ship, carrying only 60 passenger and an equal number of crew. Today she is the oldest cruise ship in regular service anywhere in the world and remains in remarkable condition. I took a run out to see her. She’s quite a sight. Her bowsprit goes on and on. If you want to learn more about this iconic ship, check out this link. 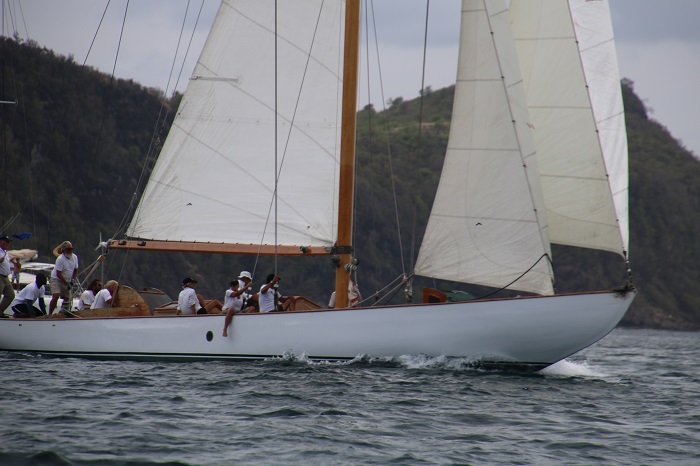 As the Easter Regatta, a pretty big deal in this area, is going on now, a wide variety of yachts, classic and contemporary are here to race. 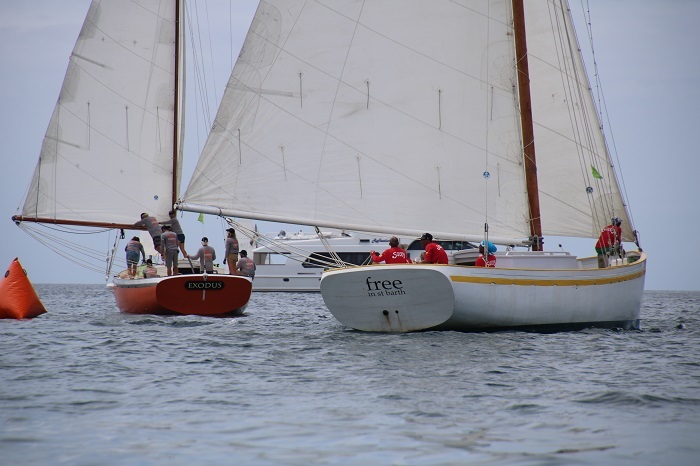 Everything from J24s to beautiful classics are out making their way around the buoys. 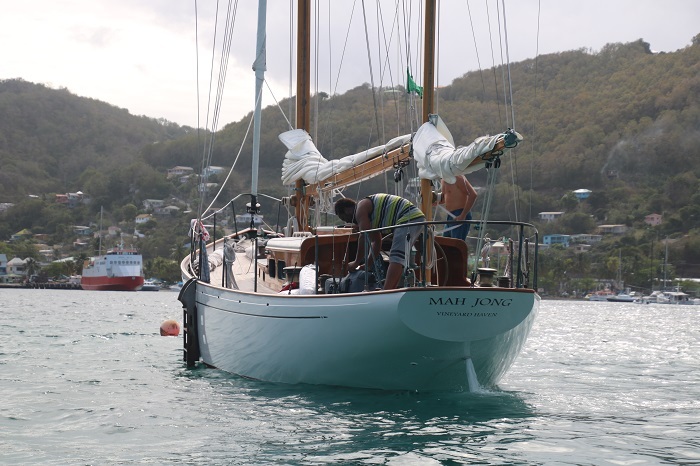 Mah Jong, a teak planked beauty, designed by Sparkman and Stephens, built by Choy Lee and launched in Hong Kong in 1957 is in these waters for the winter. She summers in Marta’s Vineyard where she was recently rebuilt at the Gannon and Benjamin yard in Vineyard Haven. She’s a beautiful yawl. What a lovely stern. I caught her rounding the weather mark today just behind another classic, Galatea. And around she went. 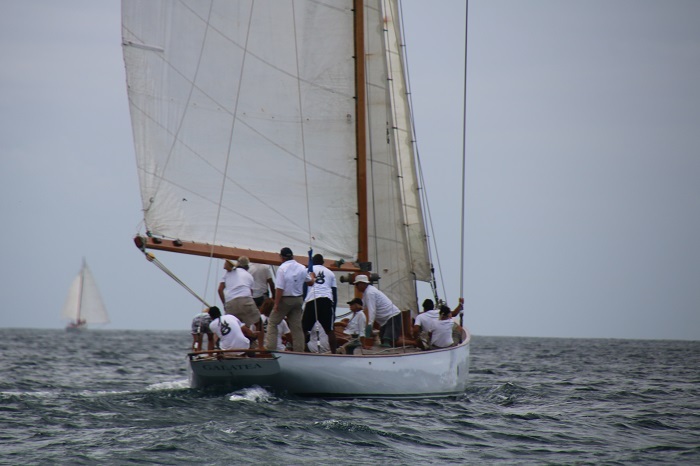 She was hot on the tail of Galatea and they approached the mark, twice that I saw, and still very close together after miles of racing. It was quite a site to see Galatea pass me by. I don’t know much about her but she’s a beauty. There are many classics by that name and without fast WiFi I ran out of patience trying to find out more about her history. And off she went to turn down wind. She’s a lot bigger than she looks in this shot, probably about 80′. 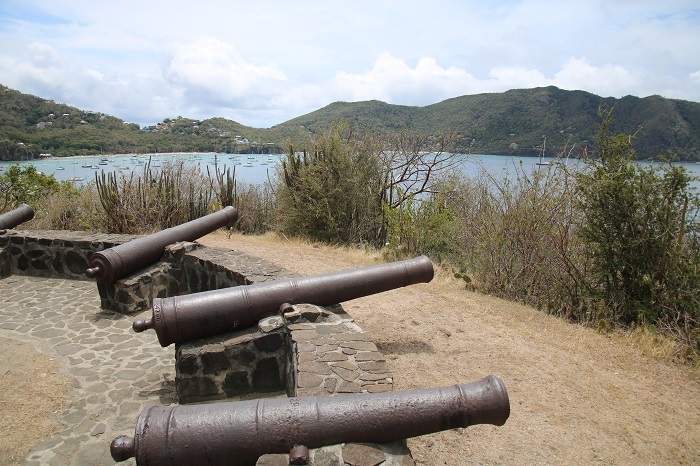 Just behind them were a few of the Carriacou sloops. 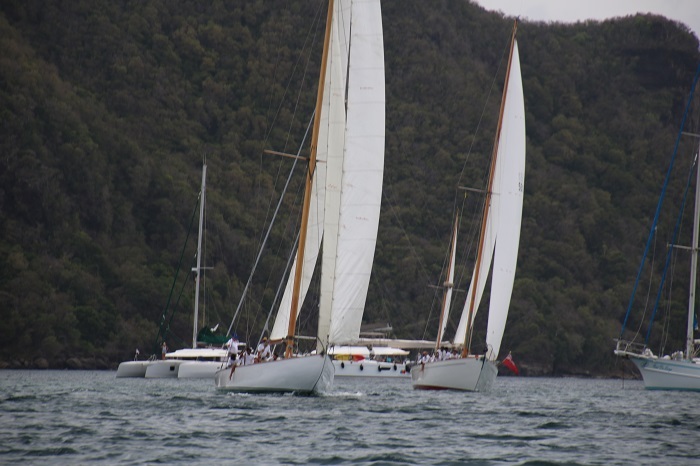 These are traditional fishing boats in the Grenadines and are still raced as yachts today. This is a go-fast locally built double ender. 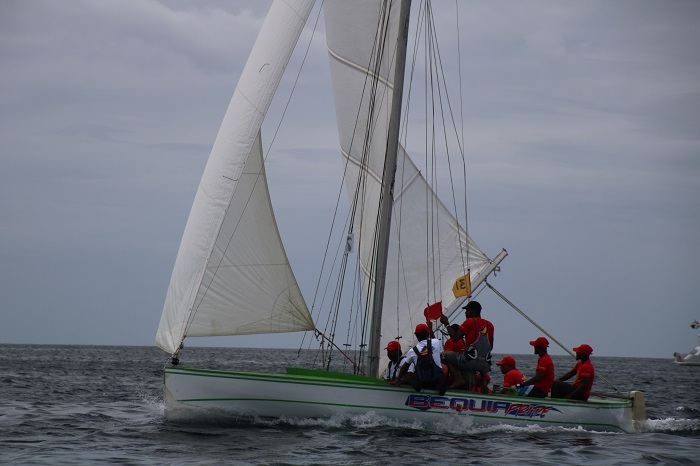 Impressive speed with big sails and a large crew to serve as “rail meat” to keep them upright. 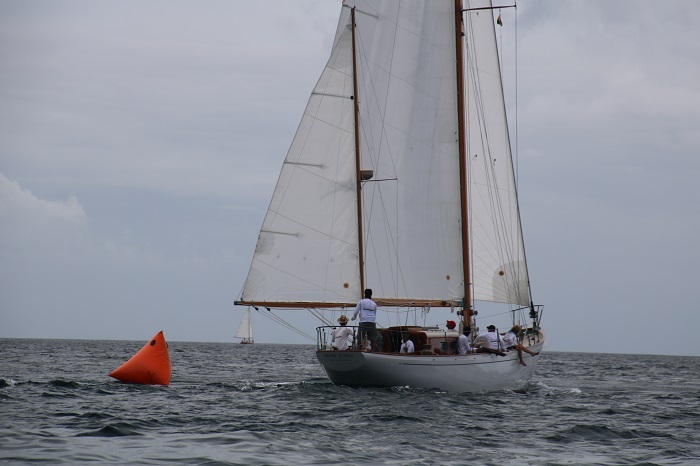 And, of course, no race is complete with out the classic J24s and there were plenty racing today. Ok, enough of the race stuff for now. Yesterday Brenda and I went for a short walk up to an old fort overlooking the harbor. I feel sorry for whoever had to lug these cannon up from the beach. The view was impressive. This is the western part of a large harbor with room for hundreds of boats. There’s Pandora in the lower right. 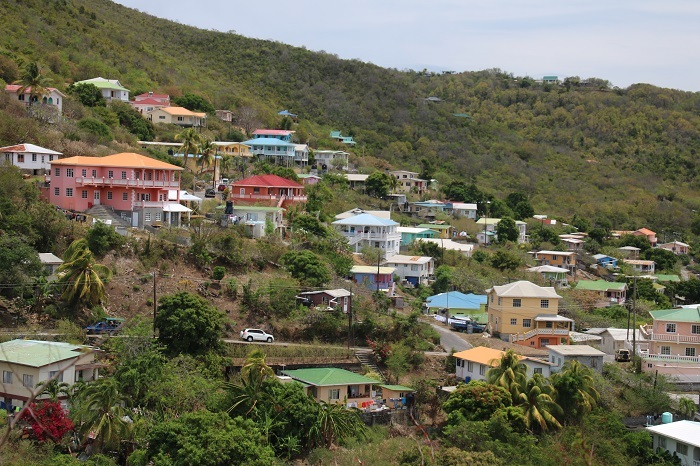 The homes on the hill overlooking the harbor are brightly painted in Caribbean colors. 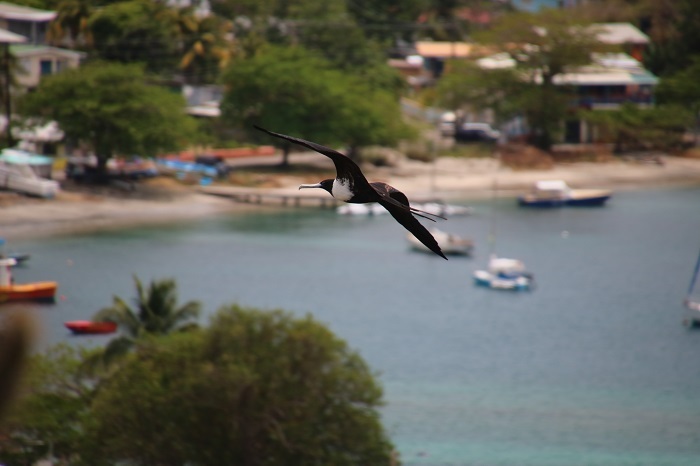 I always get a thrill out of watching the Frigate birds fly by. They have a huge wingspan, in excess of 6′, the longest of any bird, relative to their size. I understand that they can sleep while they fly and although they can be seen great distances from land they are unable to land and take off from the water. 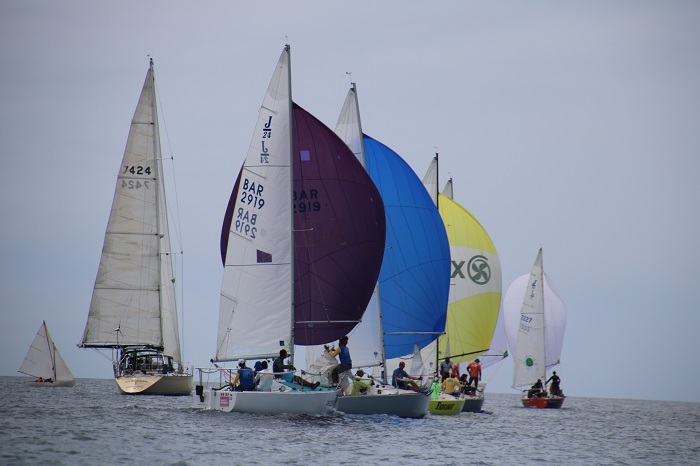 One thing is certain, if you love boats and being on the water, Bequia and especially the Easter Regatta, is the place to be. Perhaps I’ll sign off with a shot of the sunset last evening, a beautiful way to cap off a day in the tropics. Sure beats snow. No wait, it’s May. No more snow up north and I am looking forward to being back in New England for the summer. Winter in the Caribbean, summers in New England. try “De Big Chef” at the far end of the third lagoon. Good eating. Actually, its April Fools Day and snow is predicted here in PA. So you’re in a good place.